Produced by the award-winning maranGraphics Group, Maran’s Illustrated Guide to Weight Training is a valuable resource for all readers, regardless of age or fitness level. Clear, step-by-step instructions walk the reader through each exercise from beginning to end, while photographs and illustrations show you the targeted muscles for each exercise and how to help prevent injury. Thorough topic introductions and useful tips provide additional information and advice to enhance the readers’ weight training experience and help meet their individual needs. Maran’s Illustrated Guide to Weight Training is packed with information useful to readers who are just beginning to make weight training a part of their health regime. For readers who have been weight training for some time, the book is ideal as a refresher course on proper form and will present new exercises that even experienced weight trainers can add to their routines. 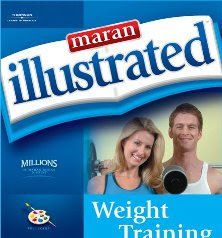 Maran Illustrated™ Weight Training is an excellent guide to exercise for all ages and skill levels. Using clear, step-by-step instructions accompanied by over 500 full color photographs, Maran Illustrated™ Weight Training is perfect for any visual learner who prefers seeing what to do rather than reading lengthy explanations. * Large full-color photographs illustrate how to correctly perform each exercise. * Step-by-step instructions explain beginner to more advanced exercises.